There are many picturesque Hertfordshire villages, but few have many surviving traditions and none have a custom as peculiar and nonsensical as Old Man’s Day. A tour of village churches will reveal the frequency of benefactor and charity boards…and indeed I have catalogued a few in this blog…but whilst doles and gifts are pleasantly quaint and common place..none have survived with such a strange stipulation. My Old Man’s a dead man! Why is it so odd? Well that is due to the legend of the titular benefactor, real name Mathew Wall. The local legend tells that when he died in 1571 it was not the end. For as the pall bearers carried his coffin down Fleece Lane on its way to burial the church, a leaf got in the way. A bearer slipped. Bang. The coffin was dropped. Everyone was apparently aghast in horror…but the level of horror was about to rise. For once the shock of dropping the coffin was got over there was a knock. An audible rap on the coffin. The undead? A zombie? No Matthew had woken up…he was alive! The account does not attest the response of the villagers then but Matthew was released from his coffin alive. Indeed he lived for another 24 years! When he did die in 1595, it is said that a thankful Wall then gave money to the village and stipulated that the 2nd of October the event should be remembered. Of course the church would not be reluctant to remember a story of a dead man resurrected! Local people often frightened of premature burial – the diagnosis of comas not being particularly successful back in the 16th century, would be happy to oblige too. One of the most curious aspect of the custom, the nonsensical aspect, is the most colourful. As the church bells toll the Death knell – a Will stipulation, children from the local school are prepared. Armed with brooms…they sweep Fleece lane. Now whilst one would expect them to sweep leaves onto the path…they sweep them off. It doesn’t make sense…if someone had done that the day of his ‘funeral’ it would have remained that his funeral…no legend no custom. Did he regret his survival? Did he become a bitter old man? Did he want to be the only one resurrected? Or did some busy-body moan that sweeping leaves onto the path would be problematic and pointless!? As the present enactment arises from the mid-20th century perhaps it was changed then by mistake? Whichever the children relish the job and the path is thoroughly swept and very few see it as an opportunity to play fight..with 50 odd students that’s quite an achievement. One can see there have been a few changes over the years. The twenty poor children are clearly the school children…although they don’t get paid (well not exactly) and they replace the poor man to sweep the path – poor men being difficult to define and unlikely to turn up – children are numerous and willing of course. It is interesting that the owner of a house on the main road called Quilters is asked to contribute £1. Why? The house is apparently where Wall lived. However it does not appear to be mentioned in the Will. Perhaps the money goes to pay the vicar who traditionally gets the same money for organising the event. Perhaps the Will contained little money. 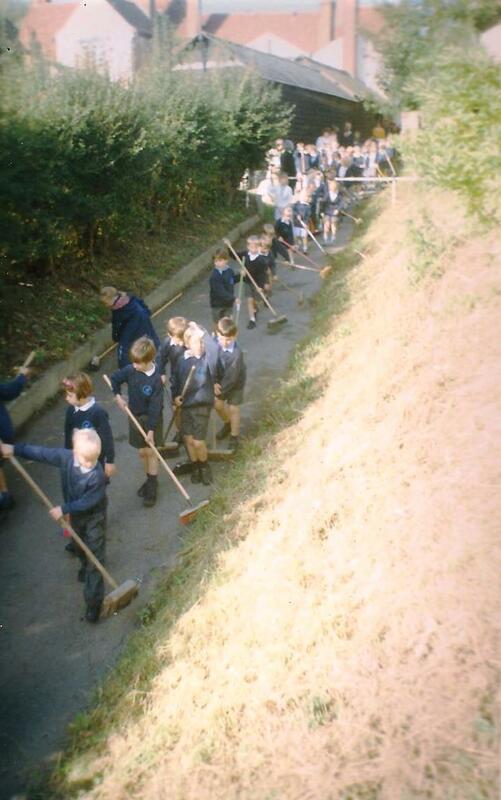 Once the lane is sweep, the children gather around Wall’s grave. A simple earth mound, well it was in the 1500s. Here prayers are said and the children sign a song, the words being held up, so they don’t forget. As soon as the song is sung, the church rings a joyous wedding peel. A celebration of his survival. Only one thing remains to thank the children with sweets…surely a modern twist to keep the children on board. 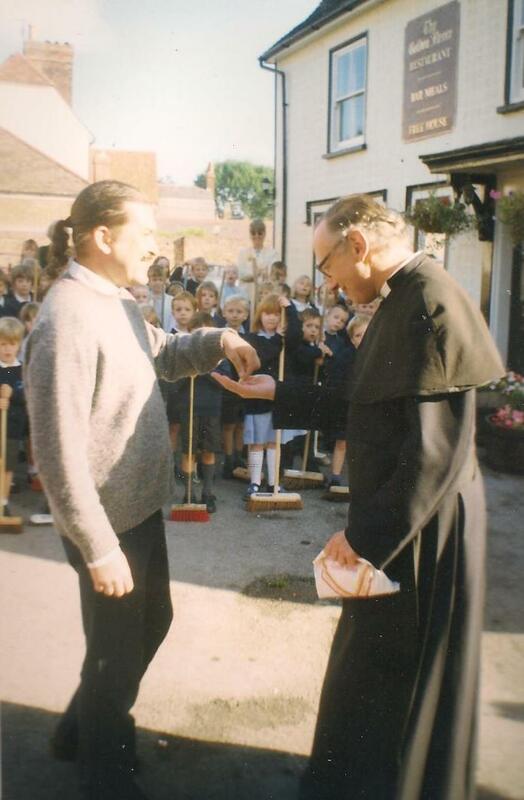 Then the children return to the classes or go home accordingly…and Matthew is forgotten for another year. I am sure he would be very pleased to see his tradition has survived where many have been lost – surviving in memory through Reformation, War and Charity commissioners…a clear device considering how many 16th century commoners graves survive today to be seen. Setting up a custom has certainly allowed his name to continue..and with such a curious and comical custom I am sure it will continue.